"One cannot imagine a more beautiful combination of intellectual keenness, artistic form and fervent love of justice. Every line is written as if for our generation." Land & Liberty has chronicled world events for over 100 years. 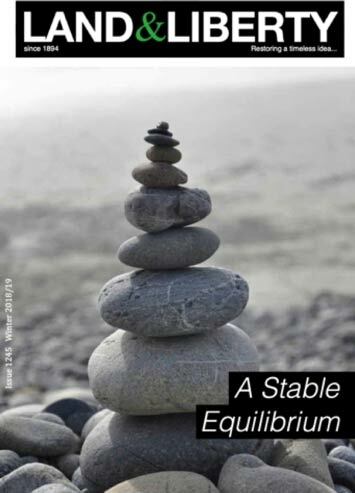 It has offered a unique perspective with its reports, analysis and comment on the core issues of political economy. The Foundation was established in January 1929 for spreading knowledge of the social and economic teachings of Henry George. The Group is engaged in regular study and occasional talks presented by members of the Group and others. This term the Group will resume with concluding considerations of material from Geroge's Protection and Free Trade. Subseequently the Group is planning to examine some recently discovered material which includes George's address to Trade Unions and the writings of some commentators who offered critique on George. In addition there will be sessions based on the poetry of Alexander Pope with presentations by Alan Roberts. Volume III, in the series The Annotated Works of Henry George published in 2018 has provided material for study throughout the Autumn Term and this will continue in the Spring Term. Chapters from the book Social Problems are being studied each week. Social Problems contains a collection of articles written by George as commissioned by an American Newspaper and later published in book form. The problems identified by George are very familiar today and the comments he provides are as relevant today as they were when first published. With the help of Frank Peddle, the Series Co-editor of The Annotated Works of Henry George,we shall then discuss the same issues in the context of George's letter to the Pope as we mount the UK launch of Volume III of this series which features The Condition of Labour, along with George's Social Problems.